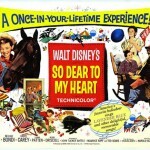 “So Dear to My Heart” by Walt Disney Productions rightly belongs in our 4-H film history archive. No, “4-H” is never mentioned in the full-length feature film… but, for good reason. The time period of the story presented was the year 1903 – long before the term “4-H” was being used. But the film tells the story of a young rural boy and his pet lamb and his goal of taking his project to the county fair and winning a blue ribbon. 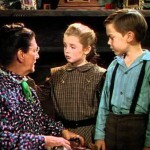 It parallels the stories and goals of thousands of young boys and girls across rural America shortly after the turn of the 20th Century in a movement that would later on be called “4-H.”Bobby Driscoll plays the part of young Jeremiah Kincaid who lives with his pious, hard-working grandmother, played by Academy Award-winning actress Beulah Bondi, on their farm near Fulton Corners, Indiana. Jeremiah was a young orphan. Burl Ives plays the part of “Uncle” Hiram Douglas, the village blacksmith, who often has to support young Jeremiah in easing the firm hand of Granny. Luana Patten plays the part of Tildy, Jeremiah’s young friend. Harry Carey is the head judge at the fair. Granny allows young Jeremiah to raise and look after a black lamb when its mother rejected it; a lamb which seems to have a way of getting into more trouble than necessary. It’s a good story with quality actors and music. A gem that should not be forgotten! 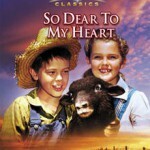 Although the official world premiere of “So Dear to My Heart” took place on January 19, 1949 in Indianapolis, Indiana, a special premiere showing of the film took place nearly two months earlier, on November 29, 1948 when it was shown to the delegates of National 4-H Congress in Chicago. Bobby Driscoll was there at the Congress to greet the delegates. 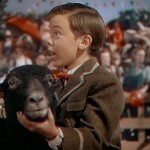 Driscoll was a tremendously popular child star in the late 1940s and early 50s. He was the first actor Walt Disney put under contract to play the lead character in “Song of the South,” Disney’s first film that combined animation and live action. Now, he was starring in the second such film, “So Dear To My Heart.” He also starred as Jim Hawkins in Disney’s “Treasure Island” and was the voice of Peter Pan in the movie by the same name. 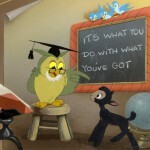 There were plans for “So Dear to My Heart” to be the first all-live-action Disney film, however in the end the full length film (1 hour; 22 minutes) featured approximately 12 minutes of animation, primarily of the “Wise Old Owl” as he sings stories about David and Goliath, Christopher Columbus and others in order to encourage “Jeremiah” in his efforts to make his lamb a champion. The film was the last screen appearance of longtime western actor Harry Carey, who died in September 1947, before the film was released. The film was based on the book, “Midnight and Jeremiah” by Sterling North, written in 1943. “So Dear to My Heart” was the film that directly inspired the creation of Disneylandia and, eventually, Disneyland. In addition to the National 4-H Congress premiere showing, the film was featured in advertisements in National 4-H News, the national magazine for volunteer leaders, for several issues around the time of its premiere. The film is available today on DVD. This entry was posted in History and tagged 4-H Hisotry, Disney Films, So Dear to My Heart by Larry Krug. Bookmark the permalink.